Lake Placid (RWH) Canadian skeleton pilots Jane Channell (BCBSA) and Barrett Martineau (ASA) are the overall winners of FIBT North America Cup 2012/2013. Jane Channell finished in third and first place at the final two races of the pre-olympic season in Lake Placid (USA) and was crowned overall champion 2012-2013 in the North America race series, followed by her Canadian teammates Madison Charney and Elizabeth Vathje. 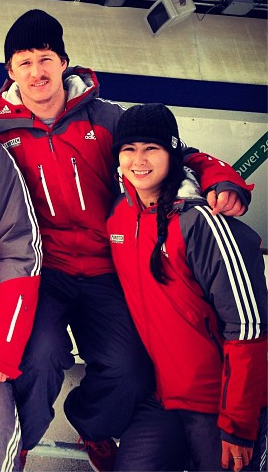 Congratulations to local BC Skeleton Athletes Jane Channell & Patrick Rooney who were both named to the Canadian National Development Team for 2012/2013! It has been nine months (or more) since we have been track side officiating and it is just possible we are feeling a wee bit rusty with the rules and our roles as officials. With three FIBT competitions in a row this season and lot of athletes counting on us to keep the game safe and fair it is time to gather and refresh ourselves on our roles as officials. Why: To become a field-of-play official for the fastest sports on ice! Slide Into Adventure Contest Winner! Congratulations Chris Gregory on winning a bobsleigh ride for themself and 2 friends courtesy of BC Bobsleigh and Skeleton Association! Chris entered our contest after visiting our booth at Crankworx. There are several upcoming talent ID camps for anyone interested in getting involved in skeleton or bobsleigh in BC. Please arrive on time. You will be required to sign a waiver and PAR-Q form to ensure you are medically fit to participate. The Camp will begin with the sprint tests; Weight testing will follow (approx. 3hrs total). Please ensure you have proper warm up and testing equipment (Track spikes, weightlifting equipment & clothing). Please be advised that all BCBSA memberships will expire on July 31st, 2012. We would like to encourage all members to renew their membership prior to, or at the AGM, which will be held on May 5, 2012. Please print and fill out the attached membership form then mail or drop it off at the BCBSA office, located at the Whistler Sliding Centre, along with your respective membership fees – submitted in cash, cheque or through our PayPal link. All members and athletes are encouraged to attend! 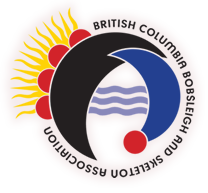 Attention Members: Election time for positions on the BCBSA Board of Directors is upon us. We would like to encourage members in good standing and who have the best interest of Bobsleigh and Skeleton in mind to run for office. Bobsleigh Canada Skeleton in association with BC Bobsleigh & Skeleton Association and Whistler Sport Legacies is hosting a Level One Officials Course on Saturday, October 20, 2012 to introduce you to our sports and help get you involved in the upcoming race season at the Whistler Sliding Centre. Races on tap this year include Skeleton Canada’s Team Selection Race, the first FIBT World Cup of the season as well as the first InterContinental Cup races in Whistler. Upon completion, you will be a certified Level One Official with a better understanding of the rules of bobsleigh and skeleton, the equipment involved and the nature of our community.